A couple of years ago we were wandering around the charming town of Port Angeles, WA while we waited to board The Coho ferry to take us home to Victoria. There is a great little gift store near the ferry terminal that is just full of lovely and unusual things.... kitchenware, baby items, lingerie, cosmetics, clothing, toys, and food goodies. The Captain spotted this lovely little bear and wouldn't leave without her... her name is Hope and she is a breast cancer survivor. You can see that she is still wearing her pink turban. When you pres the pink spot on her left paw, she opens her mouth and sings... I Hope You Dance! and she sounds eerily like Lee Ann Womack. I wanted to introduce you to Hope today... October is Breast Cancer Awareness Month, as you all likely already know, but I wanted to remind you one more time... and if you haven't already done it - schedule that mammogram, Ladies! p.s. that cute little Jack O'Lantern she is holding today is an orange, in a Jack O'Lantern costume that was given to me by my Weight Watchers leader on Friday. Isn't that the cutest idea? Do you decorate for Hallowe'en or make special food? That's the song I danced with my father to at our wedding :) Great reminder! Love this song. And I totally want to make some fun kind of dinner for Halloween! Any suggestions? Such a great song! 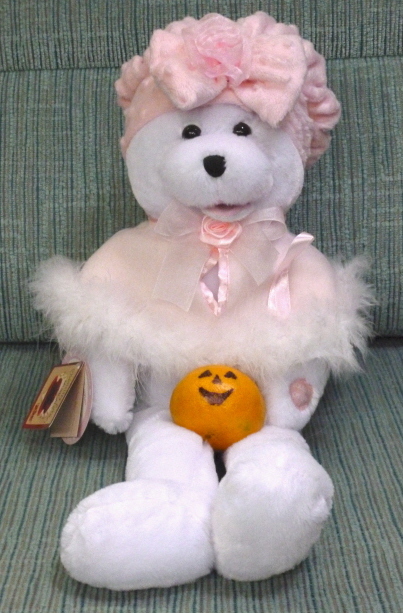 I love the little bear and pumpkin!